For us, keeping the house clean tidy relatively neat livable is a cyclical thing: for a while we'll be good about purging our belongings and enforcing the clean-up-after-yourself rule, but eventually excess stuff comes in (or maybe it multiplies overnight, I'll never know) and the kids somehow develop the habit of leaving a trail of dirty dishes and craft supplies in their wake. We know then that it's time to lay down the law. This week, we've noticed we're on the downswing of this cycle and we've been cracking down on the mess, which means that Phillip may or may not have told a child they were fired from the family for leaving dirty socks on the floor. Seriously. It's too early in the morning for this. 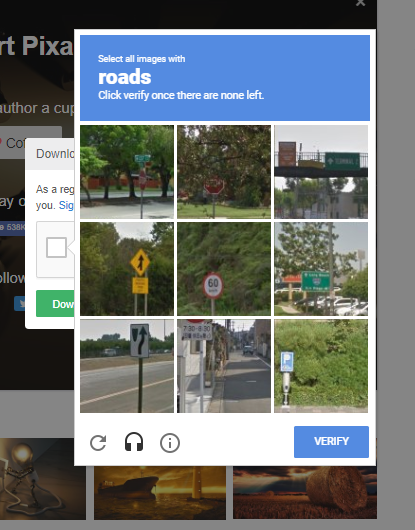 I understand Captcha codes are designed to prove I'm a human and prevent robots or whatever from using the site, but what the heck? This is like doing an activity page from Highlights magazine. I guess that's what I get for complaining about the Captchas where you have to figure out what 9+7 equals. I looked for some Mexican cereal, but unfortunately I was out of luck. Fortunately, for some reason we had a bunch of ripe avocados that weren't earmarked for any other purpose, so Phillip whipped up some guacamole. Believe me when I say the kids loved all my mom jokes about bringing 'holy guacamole' to church. They think I'm hilarious and absolutely not a total dork. As you can see, the bowl was scraped clean, so the holy guacamole must have been better than they gave it credit for. But kids under 2 don't have the verbal skills to answer, so I just have to content myself with wondering and their true objective remains a mystery. 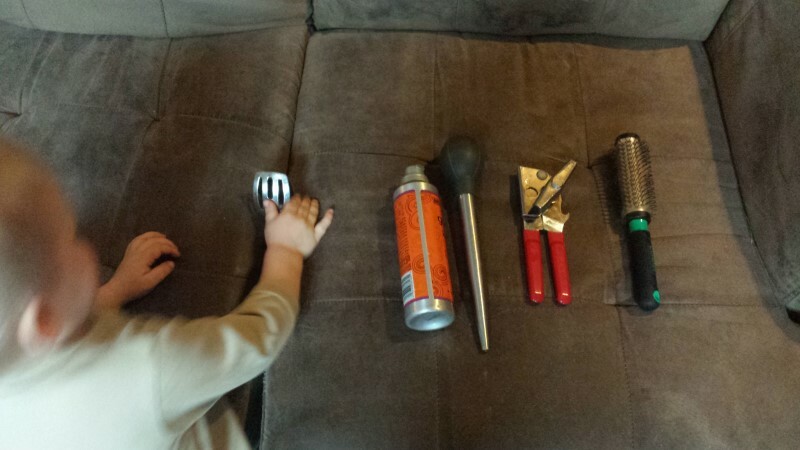 Right to left: a round brush, a can opener, a turkey baster, and a bottle of hair mousse. Oh, and he's shoving a salad tongs between the cushions. Sometimes I really wish I knew what he's thinking. Or at least whether he's playing barber, chef, or sadistic dentist. 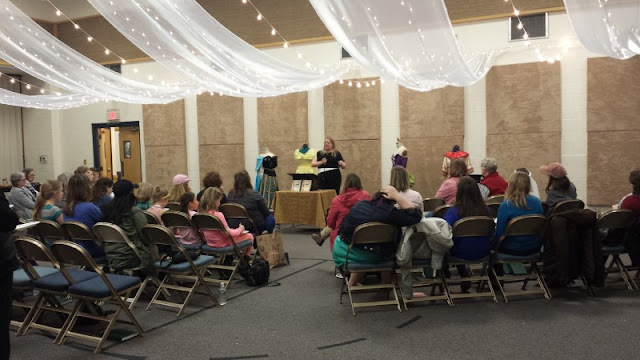 On Thursday night, there was an activity for our church women's organization. I happen to be the person responsible for planning them, which is pretty ironic since I'm a terrible event planner. Specifically, I'm terrible at making things look pretty. The morning of the activity, I was wracked with anxiety about the whole thing (another reason I'm a horrible event planner,) and I was especially concerned about the lack of decorations. In fact, I was literally asking myself whether I should go buy something (wherever it is that people buy pretty things for parties) when the phone rang. 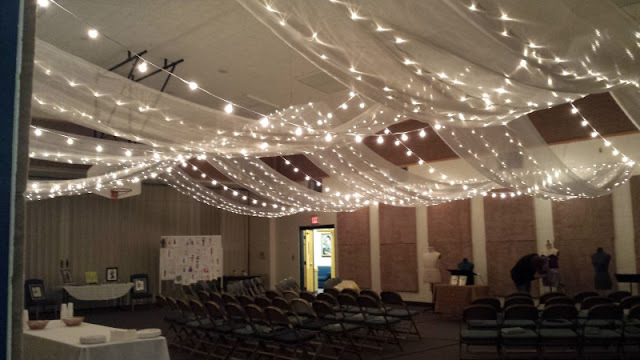 Someone was setting up the church building for a wedding reception the following night, and she knew we were using the gym tonight but she wanted to know: would it be okay if they came and decorated the ceiling this afternoon? I tried to take credit for having done this ceiling but no one would believe me. So it ended up being the prettiest activity ever, without me doing a single thing. For all future activities, my strategy will be to piggyback on major events with large decorating budgets and a committed crew of DIYers. Even aside from the fancy surprise ceiling, the activity was amazing. It was called The Hundred Dresses, and although the concept was a little hard to explain, it was a great time. After a short discussion on the book and its general themes, we broke into groups and, since we also invited the girls and teens to this activity, made toilet paper dresses. Sometimes you see this game done at bridal showers, but I thought it was okay to do at a non-wedding related activity because the dress models always look more like mummies than brides, anyway. Plus, we did have the wedding reception ceiling. And then, my favorite part of the night. 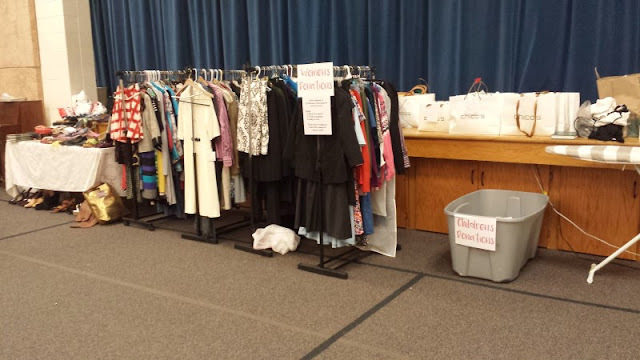 We'd made a goal to donate 100 dresses to Dress for Success, an organization that provides professional clothes to homeless and low-income women to wear to job interviews. The woman who runs our local chapter came to speak to us about what they do and the women they serve. It was an amazing night. When all was said and done, we collected over 156 dresses, skirts, pant/skirt suits, blouses, and slacks. Plus a table of dress shoes and accessories that filled 5 garbage bags at the end of the night. Dress for Success wanted all items to be wrinkle-free and ready to wear, which meant that I did more ironing that night than I have done in my whole life up to this point. I've earned my homemaker merit badge and now I think I'm done, thanks. Most of the time my kids show me random videos from YouTube like this Spanish class singing about needing to use the bathroom and I wonder, what even IS the Internet? But sometimes you find a montage of old movie stars dancing to "Uptown Funk" and it's just what you need to start your day off right. Happy Friday, guys. While we're talking about having a good Friday, I should mention you can infuse the day with 2-3 times the Unremarkable Files power by checking me out on Facebook: I'll of course be on my own page as always, but I'm also taking over the page of The Mom TruthBomb for the day. So I'm pretty much everywhere and there's no hope of escape. That video!! And also 100 dresses always gets me! So sweet and sad. I've never really liked captchas, but with the math one at least you didn't have to show your work using new math. All I can think about now is Uptown Funk!! Who ever did that montage is a straight up genius!! I enjoyed it so much!! It was on point!! On #5, that has to be the most brilliant strategy I've ever heard of for event decor. Might be slightly difficult to replicate. I always end up involved in event planning with our church too. Our church is having VBS in June and since I knew I'd have a 3-month-old at the time I let them know ahead of time that I thought it would be best if I weren't quite as involved as usual this year. So...my mom assigned me to be in charge of decor for the event (the church has to be turned into a rainforest)....and...I'm also assigned to be the main platform speaker/personality/emcee for the whole week. I'm not sure my mom understands the concept of me 'not getting so involved." "The Hundred Dresses" is such a good book, we read it as part of our school curriculum. My advice to you would be to get in touch with a couple who wants a jungle-themed wedding and offer them free use of your venue the day before. If that doesn't work... I've got nothing. I'm sure if anyone can pull it off, though, you can!